4.Sound Bars fit with any space and are sized to match your TV, you can place the unit everywhere and bring you immersive, emotionally enriching experience. 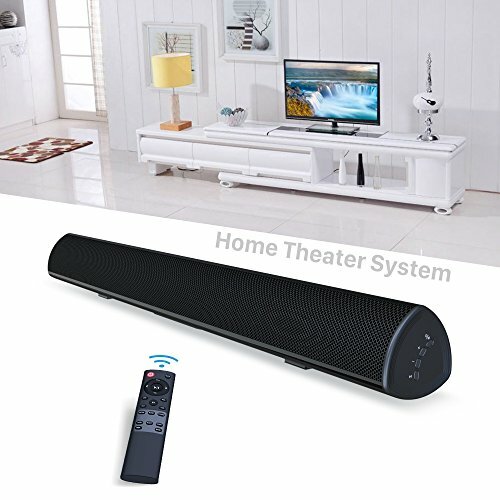 3D Surround Sound System: IR learning Function Remote to adjust Movie/Music/Dialog modes. Lets you hear every nuance of your music and movies, with crisp, breathtaking detail and unparalleled clarity. Advanced 4.2 Bluetooth Technology: Connect over Bluetooth in seconds to your any Bluetooth Audio devices. To play from TVs use the included optical cable. It also supports Coaxial in, Aux in, RCA in, USB. Crisp and Clear Sound: 2 X Improved Full Range drivers, 2 X Precision acoustic tweeter drivers, 2 X bass reflex tubes bring powerful bass, employed anti-noise technology to produce smooth, clean and wide music. 105 dB of room filling, less than 1% total harmonic distortion.